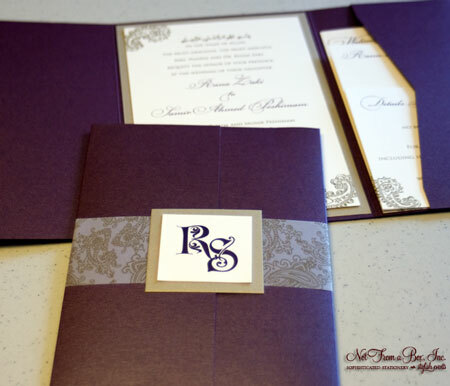 We are so pleased at how this Indian wedding Save the Date (with magnet) and Invitation ensemble turned out. We used emerald green and fushia tones for the save the date, then switched it up with metallic champagne and aubergine colors for the formal wedding invitation. 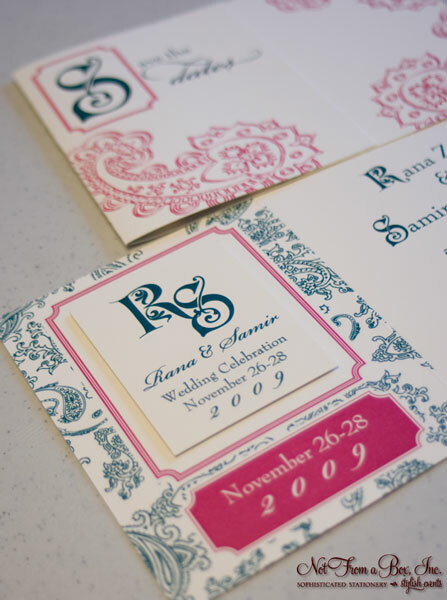 A consistent Paisley motif, as well as typefaces and custom monogram (very regal, isn’t it?) tied the two pieces together. The result? Striking. This entry was posted on September 17, 2009 at 7:30 pm and is filed under Real Weddings & Events, Wedding Invitation Design Ideas. You can follow any responses to this entry through the RSS 2.0 feed. You can leave a response, or trackback from your own site.